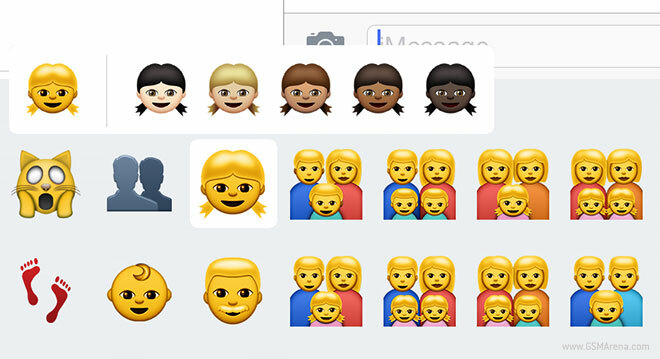 We had talked about the upcoming racially diverse emoji in iOS and OS X a few weeks ago but it finally started rolling out in yesterday’s iOS 8.3 and OS X 10.10.3 update. It’s not often the emoji stack gets updated and this is by far the biggest update it has received in years, so let’s take a closer look at it. The main change here was to diversify the skin color of the various faces. Emoji usage has exploded since Apple adopted it in iOS back in 2011 and a lot of people care about this now for the skin color of the faces to actually be an issue. Now there is no particular design for the emoji. The characters have been included in Unicode, so they are standardized across platforms but each platform is free to use their basic description and then design their own emoji characters based on that. Apple, Google, Microsoft, even Twitter, and Facebook, all have their own design sets that are exclusive to their platform. Apple’s being the oldest, has often been unofficially used in third party applications such as WhatsApp and other IM applications. The design, though, is still very much Apple’s. Emoji is a Japanese invention and one proper look at the various icons will reveal its roots. The food, for example, features the traditional Japanese rice balls (onigiri), sushi, Bento box, and rice crackers, among other items. The transport primarily feature trains, because trains are a huge part of Japanese culture. And, of course, the people are white. With the recent stress on racial and gender diversity, it makes sense that the emoji we send everyday reflected some of that diversity since less than 30% of the population is white. The latest update to the emoji keyboard in iOS 8.3 aims to fix that. If you opened the new emoji keyboard you’d see a sea of yellow faces. The standard smiley faces are the same but all the human emoji are now yellow. The yellow color is chosen specifically to be race-neutral, making it more standard than the previous white faces. However, if you want to go beyond the generic color, there is now the option to press and hold on these faces, which brings a popup of five additional skin colors ranging in skin tone from light to dark so you can be more specific. This doesn’t just apply to the faces but also to the hand signs and other emoji showing the dancer or the skier. Even Santa can be any color you want now. When you choose a color, it becomes the default for that emoji so you don’t have to press and hold every time. However, I wish there was an easy way to change all of their colors to a particular one without having to do it for each individual emoji. And this is the case for heterosexual couples. There are also options for homosexual couples, so there is a set with a man and a man and a woman and a woman with each of the options mentioned above, which takes the set from a single option to fifteen in the latest update. Other than the diversity options, Apple also made some other changes to the keyboard. So now you can just slide the keyboard sideways and it doesn’t snap page wise but just scrolls smoothly like a list allowing you to move between categories smoothly. Some of the other emoji have also been updated. So the old computer emoji has been replaced by a spanking new iMac. The phone emoji that have been the same since the original iPhone now show the new iPhone 6. And the watch emoji has been replaced with the Apple Watch. There are also way more flags now, something we saw first in Android Lollipop and general spit and polish to some of the other older icons. This whole thing might seem frivolous to some but to others it makes a difference. If we have to progress as a society, you can’t ignore the little things, especially when they have become a big part of our lives. Hopefully, other platforms will soon implement these emoji as well.